J Clin Invest. 2007;117(3):513–513. https://doi.org/10.1172/JCI31577. Matt Ridley. HarperCollins. New York, New York, USA. 2006. $19.95ISBN: 978-0-060-82333-7 (hardcover).224 pp. Francis Crick was, as every biologist and clinician knows, at the center of a great scientific revolution that completely transformed biology over the second half of the 20th century. Matt Ridley’s brief biography of Crick, elegantly and compellingly written, captures the excitement of this revolutionary time and accurately describes his work and the evolution of his ideas, while conveying a good sense of what Crick was like as a person. Ridley progresses, mainly chronologically, through Crick’s life, interweaving life events with elements of the intellectual history of modern biological science. 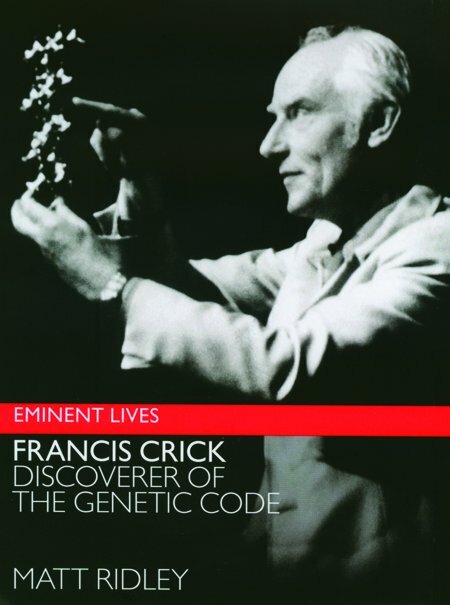 Crick was born during World War I into a middle-class family in the English Midlands. He was interested in science as a child, and at around age 12 he became an atheist, strongly maintaining this belief throughout his life, as he concluded that science was incompatible with, and trumped, religion. Although clearly a thoughtful child, Crick was not academically precocious and at 18 entered University College London, rather than Oxford or Cambridge University, to study physics, and then, with a second-class degree, continued on to graduate school in experimental physics. His graduate school career was undistinguished, but Crick was saved from pursuing studies he did not really like by England’s entry into World War II. Like many academics, he became involved in war-related research and, at the Admiralty, was much more successful than he had been as a physics graduate student. During the early war years, Crick married Doreen Dodd and had a son, Michael (who was born during an air raid); this marriage ended in divorce seven years later. After the war, Crick continued to work for the Admiralty but embarked on a program of self-education in chemistry and biology (as well as theoretical physics). Crick was 30 by this time, and his reputation from the war research helped him land a Medical Research Council studentship at Cambridge University, where he finally ended up working with Max Perutz on crystallography at the Cavendish Laboratory. Around this same time, Crick married Odile Speed and started to work again on his PhD, this time in structural biology. Throughout the remainder of his scientific life, Crick always sought understanding of function through structure. His graduate career in structural biology was much more successful than his graduate career in experimental physics had been, but by the time he was 35 Crick still did not have his PhD. It was then that the most important event in Crick’s scientific career occurred: James Watson came to work at Cambridge. Most scientists work out their ideas through internal conversations with themselves, and Crick certainly did this, but for him it was especially important to have his idea-developing conversations with another person. Throughout his career, Crick always had a friend and close collaborator who was a vital part of the process of understanding the problem at hand and of developing his ideas. But not just anyone would do, and through the half century of his work, Crick had three important collaborators: James Watson, Sydney Brenner, and Christof Koch. Crick and Watson immediately hit it off. Both had settled on understanding the basis of inheritance as the most important problem in biology — the secret of life — and both believed that genetic information had to be in some way encoded in DNA. The story of how they solved the structure of DNA, and started the modern field of molecular biology, is told by Ridley in a way that captures the excitement of their journey of discovery and explains the intellectual struggle to get there (this story is told from a different perspective in Watson’s great scientific autobiography, The double helix; ref. 1). At 37 Crick had finally made the first important scientific contribution of his life, but it was a momentous one. Nevertheless, the gap between determining the structure of DNA and understanding the exact role of DNA in biology was gigantic, and the next quarter century of Crick’s life was devoted to developing the ideas that now constitute the basics of molecular biology: the genetic code, mRNA, and the translation of mRNA into proteins. Ridley clearly explains the history of these developments and Crick’s central role in them and then outlines the last 25 years of his life at the Salk Institute in La Jolla, California, where Crick had a second, but less revolutionary, career studying the brain. Ridley’s brief biography of Crick is part of the publisher’s Eminent lives series, written by various notable authors — the preceding two volumes in the series covered the lives of Beethoven and Caravaggio, and the one that follows Ridley’s and that has just appeared is a life of Muhammad; each volume is really an extended biographical sketch rather than a full biography. The brief biography is a genre of its own, quite distinct from a full examination of a person’s life and times, and must be judged by its own standards. As a brief biography, Ridley’s book is wonderful and succeeds not only in laying out the basic events of Crick’s life but also providing context by describing the scientific facts and ideas involved and the people who were important to him.